Today, as with many recent days, Oklahoma is experiencing hot, dry, critical fire hazard conditions. And over the past month, historically exceptional drought and hotter than normal weather have spurred a spate of very severe and seemingly unrelenting wildfires across the state. During mid-to-late April, the Rhea Fire scorched 286,000 acres destroying more than 50 homes and killing hundreds of cattle. At about the same time, the 34 Complex fire burned through 62,000 acres and forced many Oklahoma residents to evacuate. For reference, the massive Thomas Fire which burned hundreds of structures in California this past December was 240,000 acres in size. Unfortunately, severe fire conditions continued through today with 500 acres going up in flames near Pawnee Oklahoma in just the past 24 hours. In total, about 350,000 acres have burned so far this year (an area half the size of Rhode Island), numerous structures have been destroyed and an estimated 2,000 cattle have likely been killed. With severe drought, heat, and extreme fire conditions expected to continue throughout at least the next month, there is little relief in sight. The causes of the present fire hazard are quite clear. Throughout fall, winter, and spring, the Central U.S. has experienced both hotter and drier than normal conditions. During recent weeks, drought in this region has become exceptional — the highest drought category provided by the National Drought Monitor. In addition, strong, warm south-to-north winds have tended to prevail over the region. These winds have rapidly fanned many recent Oklahoma fires to massive size. Over the coming month, this drought is expected to dig in as temperatures warm. And, as a result, fire danger is expected to be quite high for a broad region of the U.S. South stretching from just west of the Mississippi all the way to California. 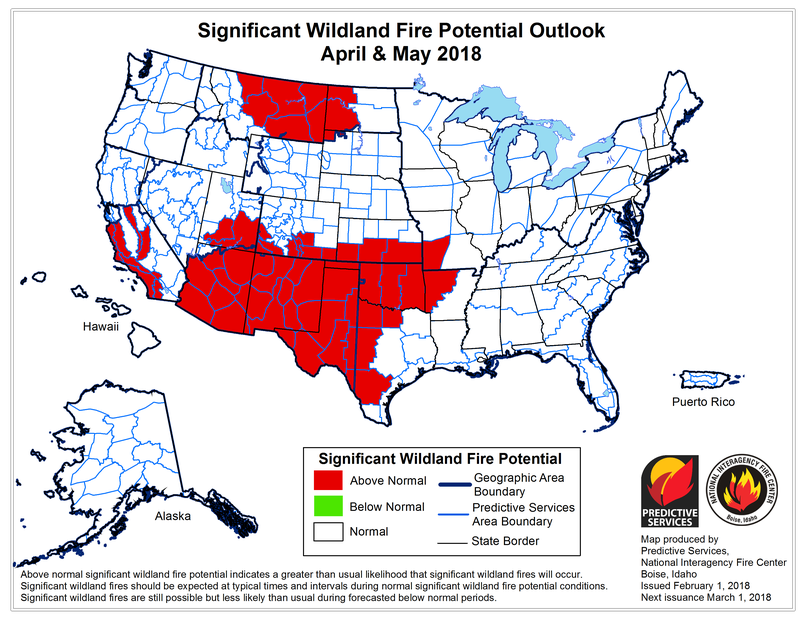 Though spring wildfires do occur across Oklahoma and parts of the plains states, the trend has been for an increasing large fire incidence. This trend, in turn, has been driven by human-caused climate change. For as the U.S. has warmed, the rate of evaporation from soils, vegetation and lakes has increased. This higher rate of moisture loss both intensifies drought and spikes fire risk. Warming and worsening drought has been a particularly acute set of affairs for Central and Western states. The number of weeks when large fires are a risk has increased from 50 to 600 percent for most of these regions. In other words, if it seems like there are more large fires, it’s because there are. And what we see now are spring prairie fires that are far more intense than they were in the past.